You wouldn’t know it to hear eleven minutes of Aram Khatchaturian’s “Sabre Dance” performed on electric guitar, but the long-haired Welsh kid with the fiendishly fast fingers secretly wanted to be, not the next Eric Clapton or Keith Emerson, but the new Carl Perkins. 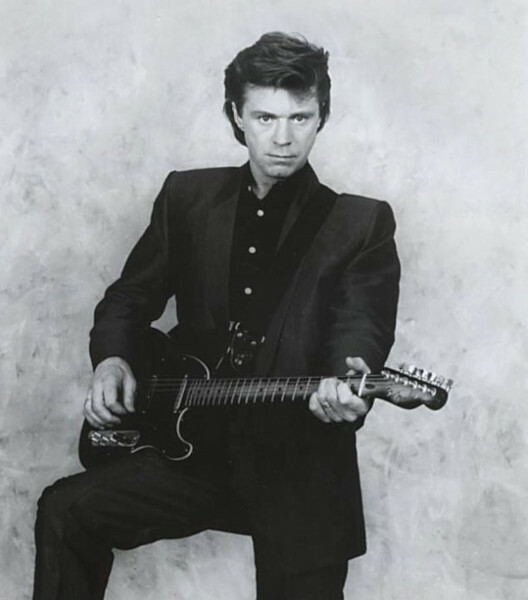 Dave Edmunds got his first taste of fame with the Cream-y trio, Love Sculpture, who released two albums: Blues Helping (1968) and Forms And Feelings (1970). Edmunds, who was keenly interested in studio recording, came a-knocking on the charts soon after with a clever reworking of Smiley Lewis’ “I Hear You Knocking” that featured vocals recorded through a telephone line. A year later, Edmunds released his first solo record, Rockpile (1972), multitracking most of the instruments himself and performing material by Chuck Berry, Bob Dylan and Neil Young. Subtle As A Flying Mallet (1975) followed, again featuring mostly cover material and marking the full-time participation of Nick Lowe, whom Edmunds had produced the year earlier in the now-defunct Brinsley Schwarz. Get It (1976) brought their collaboration to the fore, mixing originals with covers by Bob Seger, Otis Blackwell and Hank Williams. Despite a strong of successful singles in the UK, Edmunds wasn’t able to translate that into strong album sales, a situation he lamented on “A1 On The Jukebox” from Tracks on Wax 4 (1978). That changed with Repeat When Necessary (1979), which cracked the Top 100 in the US and UK on the strength of songs by Elvis Costello (“Girls Talk”) and Graham Parker (“Crawling From The Wreckage”). Edmunds, Lowe, Terry Williams (an Edmunds fixture since the Love Sculpture days) and Billy Bremner—the core nucleus of recent Lowe and Edmunds records—consummated their relationship with the formation of Rockpile, releasing one album, Seconds of Pleasure (1980) and touring briefly to support it. The record represented the culmination of the Lowe/Edmunds alliance, after which the pair went in separate directions (they did re-unite in 1990 for Lowe’s Party of One). In the mid 1980s, Edmunds experimented with mainstream pop; Riff Raff (1984), produced by ELO’s Jeff Lynne, sounded more like a modern Moody Blues record, though Edmunds later redeemed himself by organizing an all-star tribute for Carl Perkins that featured George Harrison, Eric Clapton and Ringo Starr. Despite his association with various musical movements (psychedelic rock, pub rock, new wave), Edmunds’s sympathies are best exemplified in his rockabilly revivalism and painstaking production work. He has released little new music in the 21st century, but tours occasionally and has left behind a legacy of well-crafted rock and roll records. b/w Black Bill. Released on 7-inch single in November 1970 in the UK (MAM, MAM-1), the US and Canada (MAM, MAM-3601), Australia (MAM, MAM-9327), Canada (MAM, 45-3601), Japan (MAM, TOP-1582), New Zealand (Decca, EC-525) and Spain (MAM, MO 1059); reached #1 on the UK charts (charted on November 21, 1970 for 14 weeks) and #4 in the US. Regional versions feature picture sleeve. Reissued on 7-inch in 1980 in the UK (Blueprint, BLU 2010). b/w Country Roll. Released on 7-inch in 1971 in the UK (Regal Zonophone, RZ-3032); reached #75 on the US charts. Also released as a promotional 7-inch single in 1971 in the US (MAM, 45-3608) with mono/stereo versions of the A side. b/w I’ll Get Along. Released on 7-inch in 1971 in the UK (Regal Zonophone, RZ-3037) and the US (MAM, 45-3611). Down Down Down / I Hear You Knocking / Hell of A Pain / It Ain’t Easy / Promised Land / Dance Dance Dance / (I’m A) Lover Not A Fighter / Egg Or The Hen / Sweet Little Rock & Roller / Outlaw Blues. Released on elpee in January 1972 in the US (MAM). Re-released on expanded CD with six bonus tracks (“I Hear You Knocking (mono single mix),” “Black Bill,” “I’m Coming Home,” “Country Roll,” “Blue Monday,” “I’ll Get Along”) in 2001 (Repertoire). b/w Maybe. Released on 7-inch in January 1973 in the UK (Rockfield, ROC-1) and the US (RCA, 74-0882); reached #8 on the UK charts (charted on January 20, 1973 for 13 weeks). b/w Pick Axe Rag. Released on 7-inch in June 1973 in the UK (Rockfield, ROC 2) and the US (RCA, DJBO-5000); reached #5 on the UK charts (charted on June 9, 1973 for 12 weeks). b/w Let It Be Me. Released on 7-inch in 1974 in the UK (Rockfield, ROC-4) and the US (RCA, 10118) and in 1975 in Germany (RCA, PPBO-7009). Regional versions feature picture sleeve. Baby I Love You / Leave My Woman Alone / Maybe / Da Doo Ron Ron / Let It Be Me / No Money Down / A Shot of Rhythm And Blues / Billy The Kid / Born To Be With You / She’s My Baby / I Ain’t Never / Let It Rock. Released on elpee and 8-track in 1975 in the UK (RCA Victor, PL-25129) and the US (RCA, LPL1/LPS1-5003). Re-released on expanded D with two bonus tracks (“Pick Axe Rag,” “Some Other Guy”) in 2005 in the UK (Acadia, ACA-8114). b/w As Lovers Do. Released on 7-inch in 1976 in the UK (Swan Song, SSK-19408). b/w New York’s A Lonely Town. Released on 7-inch in 1976 in the UK (Swan Song, SSK-19049). Get Out of Denver / I Knew The Bride / Back To School Days / Here Comes The Weekend / Worn Out Suits, Brand New Pockets / Where Or When // Juju Man / Git It / Let’s Talk About Us / Hey Good Lookin’ / What Did I Do Last Night? / Little Darlin’ / My Baby Left Me. Released on elpee in 1977 in the UK (Swan Song, SSX-59404), the Us, Australia and Canada (Swan Song, SS-8418), Germany (Swan Song, SS-59404) and Japan (Swan Song, P-10392N). Reissued on CD on February 28, 2006 in the US (Wounded Bird, 8418). b/w Back To School Days. Released on 7-inch in June 1977 in the UK (Swan Song, SSK-19411); reached #26 on the UK charts (charted on July 2, 1977 for 8 weeks). b/w What Did I Do Last Night? Released on 7-inch in 1977 in the UK (Swan Song, SSK-19410). b/w I Knew The Bride. Released on 7-inch in 1977 in the US (Swan Song, SS-70113). Also released as promotional 7-inch in 1977 in the US (Swan Song, SS-70113) with stereo/mono versions of the A side. b/w Get Out of Denver (mono). Released as promotional 7-inch in 1977 in the US (Swan Song, 70116). Trouble Boys / Never Been In Love / Not A Woman, Not A Child / Television / What Looks Best On You / Readers Wives / Deborah / Thread Your Needle / A1 On The Jukebox / It’s My Own Business / Heart of The City. Released on elpee and 8-track in 1978 in the UK (Swan Song, SSX-59407) and the US (Swan Song, SS/TP-8505). b/w What Looks Best On You. Released on 7-inch in 1978 in the UK (Swan Song, SSK-19413). b/w Never Been In Love. Released on 7-inch in 1978 in the UK (Swan Song, SSK-19414) with picture sleeve. b/w What Looks Best On You. Released on 7-inch in 1978 in the US (Swan Song, SS 70118). Also released as promotional 7-inch in 1978 in the US (Swan Song, SS 70118) with stereo/mono versions of A side. Girls Talk / Crawling From The Wreckage / The Creature From The Black Lagoon / Sweet Little Lisa / Dynamite // Queen of Hearts / Home In My Hand / Goodbye Mr Good Guy / Take Me For A Little While / We Were Both Wrong / Bad Is Bad. Released on elpee, cassette and 8-track in June 1979 in the UK (Swan Song, SSK-59409/SK 459409), the US (Swan Song, SS/CS/TP-8507), Brazil (Swan Song, 30125), Canada (Swan Song, QSS 8507), Germany (Swan Song, SS-59 409) and Japan (Swan Song, P-10731N); reached #39 on the UK charts and #54 on the US charts. Reissued on CD in the US (Swan Song, 8507). b/w Bad Is Bad (UK), Creature From The Black Lagoon (US). Released on 7-inch and 7-inch clear vinyl in June 1979 in the UK (Swan Song, SSK-19418) and the US (Swan Song, SS 71001); reached #4 on the UK charts (charted on June 30, 1979 for 11 weeks) and #65 on the US charts. Regional versions feature picture sleeve. b/w Creature From The Black Lagoon. Released on 7-inch in September 1979 in the UK (Swan Song, SSK-19419) with picture sleeve; reached #11 on the UK charts (charted on September 22, 1979 for 9 weeks). b/w As Lovers Do. Released on 7-inch in November 1979 in the UK (Swan Song, SSK-19420) with picture sleeve; reached #59 on the UK charts (charted on November 24, 1979 for 4 weeks). b/w The Race Is On. Released on 7-inch in February 1980 in the UK (Swan Song, SSK-19422) and the US (Swan Song, SS-72003); reached #28 on the UK charts (charted on February 9, 1980 for 8 weeks). Regional versions feature picture sleeve. Something Happens / It’s Been So Long / Singin’ The Blues / (I’m Gonna Start) Living Again If It Kills Me / Almost Saturday Night // Cheap Talk, Patter And Jive / Three Time Loser / You’ll Never Get Me Up (In One of Those) / I’m Only Human / The Race Is On / Baby Let’s Play House. Released on elpee and cassette in April 1981 in the UK (Swan Song, K 459 411), the US (Swan Song SS-16034) and Japan (Swan Song, P-11041N); reached #37 on the UK charts and #48 on the US charts. b/w You’ll Never Get Me Up (In One of Those). Released on 7-inch in 1981 in the UK (Swan Song, SSK-19424) and the US and Canada (Swan Song, SS-72000) with picture sleeve; reached #58 on the UK charts (charted on March 28, 1981 for 3 weeks) and #54 0n the US charts. Also released as a promotional 7-inch in 1981 in the US (Swan Song, SS-72000) with stereo/mono versions of the A side. b/w I’m Gonna Start Living Again If It Kills Me. Co-credited to The Stray Cats and released on 7-inch in June 1981 in the UK (Swan Song, SSK-19425) with picture sleeve; reached #34 on the UK charts (charted on June 20, 1981 for weeks). Deborah / Girls Talk / I Knew The Bride / A1 On The Jukebox / The Race Is On / Here Comes The Weekend / Almost Saturday Night // Queen of Hearts / Crawling From The Wreckage / Trouble Boys / Juju Man / Singin’ The Blues / The Creature From The Black Lagoon. Released on elpee and cassette in 1981 in the US (Swan Song, SS/M5A-8510); reached #163 on the US charts. From Small Things (Big Things One Day Come) / Me And The Boys / Bail Me Out / Generation Rumble / Other Guys Girls / Warmed Over Kisses (Leftover Love) / Deep In The Heart of Texas / Louisiana Man / Paula Meet Jeanne / One More Night / Dear Dad. Released on elpee and cassette in 1982 in the UK (Arista, SPART-1184), the US (Columbia, FC/FCT-37930), Germany (Arista, 404 508) and Japan (Arista, 25R5-163); reached #46 on the US charts. Repackaged w. Information on expanded CD on May 14, 2002 in the UK (Beat Goes On). b/w Louisiana Man. Released on 7-inch in 1982 in the UK (Arista, 439) with picture sleeve. Released as one-track promotional 7-inch in 1982 in the US (Columbia, 18-02960). b/w Queen of Hearts (live). Released on 7-inch in 1982 in the UK (Arista, ARIST-471) with picture sleeve. b/w Deep In The Heart of Texas. Released on 7-inch in 1982 in the US and Canada (Columbia, 38-03428) with picture sleeve. Also released as one-track promotional 7-inch in 1982 in Canada (Columbia, AE7-1576). Reissued on 7-inch in the US (Columbia, 13-05487) with “From Small Things” on the flip side. Slipping Away / Don’t You Double / I Want You Bad / Wait / The Watch On My Wrist / The Shape I’m In // Information / Feels So Right / What Have I Got To Do (To Win) / Don’t Call Me Tonight / Have A Heart. Released on elpee and cassette in 1983 in the US (Columbia, FC/FCT-38651) and Germany (Arista, 205 348); reached #51 on the US charts. Also released as picture elpee in 1983 in the US (Columbia, AS99-1725). b/w Don’t Call Me Tonight. Released on 7-inch and 12-inch in March 1983 in the UK (Arista, ARIST-522/12-522, clear vinyl on 7-inch) and the US and Canada (Columbia, 38-03877); reached #60 on the UK charts (charted on March 26, 1983 for 4 weeks) and #39 on the US charts. Also released as one-track promotional 12-inch in 1983 in the US (Columbia, 1660). b/w What Have I Got To Do To Win. Released on 7-inch and 12-inch in 1983 in the UK (Arista, 532) and Germany (Arista, 105 677-100) with picture sleeve. Also released as one-track promotional 7-inch in 1983 in the US (Columbia, 38-04080). Something About You / Breaking Out / Busted Loose / Far Away / Rules of The Game / Steel Claw / S.O.S. / Hang On / How Could I Be So Wrong / Can’t Get Enough. Released on elpee and cassette in 1984 in the UK and Germany (Arista, 206/406 396), the US (Columbia, 39273) and Japan (Arista, 25RS-238); reached #140 on the US charts. Reissued on expanded CD with I Hear You Rockin’: Greatest Hits Live on July 2, 2002 in the UK (Beat Goes On). b/w Can’t Get Enough. Released on 7-inch in October 1984 in the UK (Arista, ARIST-562) and Canada (Columbia, 38-04585). Regional versions feature picture sleeve. Also released as one-track promotional 12-inch in 1984 in the US (Columbia, AS-1911). b/w How Could I Be So Wrong. Released on 7-inch in 1984 in the UK (Arista, ARIST-583) with picture sleeve. b/w Porky’s Revenge. Released on 7-inch in 1985 in the UK (CBS, A-6277) and the US and Canada (Columbia, 38-04762) with picture sleeve; reached #91 on the US charts. b/w Don’t Call Me Tonight. Released on 7-inch in 1985 in the US (Columbia, 38-04923). Also released as one-track promotional 12-inch in 1985 in the US (Columbia, CAS-2077). b/w Dave Edmunds Mega Mix. Released as promotional 12-inch in 1986 in the US (Columbia, 2598). Live tracks: Girls Talk / Here Comes The Weekend / Queen of Hearts / Paralyzed / The Wanderer / Crawling From The Wreckage / Slipping Away / Information / I Hear You Knocking / I Knew The Bride (When She Used To Rock N Roll) / Juju Man. Live album credited to The Dave Edmunds Band and released on elpee, cassette and CD in 1987 in the US (Columbia, CK-40603); reached #106 on the US charts. Closer To The Flame / Fallin’ Through A Hole / Don’t Talk To Me / Every Time I See Her / Stockholm / King of Love / I Got Your Number / Never Take The Place of You / Sincerely / Test of Love / Stay With Me Tonight. Released on elpee and cassette in 1989 in the US (Capitol, 90372); reached #146 on the US charts. b/w Stay With Me + Every Time I See Her, King of Love (78 rpm). Released on 7-inch, 10-inch, 12-inch and CD single in April 1990 in the UK (Capitol, CL/10CL/12CL/CDCL-568) with picture sleeve; reached #68 on the UK charts (charted on April 7, 1990 for one week). Also released as one-track promotional CD single in 1990 in the US (Capitol, DPRO-79773). b/w Don’t Talk To Me. Released as two-track promotional 7-inch in 1990 in Japan (Capitol, PRP-1507) with picture sleeve. Also released as one-track promotional CD single in 1990 in the US (Capitol, DPRO-79938). Morning Dew / It’s A Wonder / Brand New Woman / The Stumble / 3 O’Clock Blues / I Believe To My Soul / So Unkind / Summertime / On The Road Again / Don’t Answer The Door / Wang-Dang-Doodle / Come Back Baby / Shake Your Hips / Blues Helping // In The Land of The Few / Seagull / Nobody’s Talking / Farandole / You Can’t Catch Me / Mars / Sabre Dance (Single Version) / Sabre Dance / Why / People People / Think of Love // Down Down Down / I Hear You Knocking / Hell of A Pain / It Ain’t Easy / The Promised Land / Dance Dance Dance / (I Am) A Lover Not A Fighter / Egg Or The Ham / Sweet Little Rock ‘n’ Roller / Outlaw Blues / Black Bill / Country Roll / I’m Comin’ Home / Blue Monday / I’ll Get Along. Compilation released on 3LP in 1991 in Germany (EMI, 7967171). River To Another Day / The Stumble / Sabre Dance / Summertime / In The Land of The Few / Farandole / I Hear You Knocking / The Promised Land / Down Down Down / Born To Be With You / Leave My Woman Alone / Here Comes The Weekend / I Knew The Bride / Juju Man / Little Darlin’ / Let’s Talk About Us / As Lovers Do / Trouble Boys / Deborah / Never Been In Love // Girls Talk / Crawling From The Wreckage / The Creature From The Black Lagoon / Queen of Hearts / Sing The Blues / Baby Ride Easy / Crying In The Rain / If Sugar Was As Sweet As You / Almost Saturday Night / (I’m Gonna Start) Living Again If It Kills Me / The Race Is On / From Small Things, Big Things Come / Me And The Boys / Warmed Over Kisses (Leftover Love) / One More Night / Slipping Away / Information / Something About You / High School Nights / King of Love / Closer To The Flame. Compilation released on 2CD in 1992/3 in the US (Rhino, RHI-71191). Chutes And Ladders / One Step Back / I Love Music / Halfway Down / Beach Boy Blood (In My Veins) / The Claw // I Got The Will / Better Word For Love / Standing At The Crossroads / It Doesn’t Really Matter / Sabre Dance. Released on CD and cassette in 1994 in the US (Pyramid, 71770-2/4). Released as one-track promotional CD single in 1994 in the US (Pyramid, PRCD-7091). b/w Beach Boy Blood. Released as two-track promotional CD single in 1994 in the US (Pyramid, PRCD-7107). Sabre Dance / You Can’t Catch Me / I Hear You Knocking / Down, Down, Down / Baby I Love You / Born To Be With You / Get Out of Denver / I Knew The Bride / Trouble Boys / Girls Talk / Queen of Hearts / Crawling From The Wreckage / Singing The Blues / Baby Ride Easy / Almost Saturday Night / The Race Is On / Warmed Over Kisses (Leftover Love) / From Small Things, Big Things Will Come / Slipping Away / Something About You. Compilation released on CD on November 21, 1994 in the UK (Connoisseur Collection, VSOP CD 209). Released on CD on February 10, 1997 in France (RCA Camden Classics, 4519226). You Can’t Catch Me / The Stumble / Sabre Dance (single version) / In The Land of The Few / Blues Helping / Down Down Down / I Hear You Knocking / Farandole / Wang Dang Doodle / (I Am) A Lover Not A Fighter / Egg Or The Hen / 3 O’Clock Blues / So Unkind / The Promised Land / Dance, Dance, Dance / Outlaw Blues / Sweet Little Rock ‘N’ Roller / Don’t Answer The Door. Compilation released on CD in 1997 in the UK (EMI Gold, 55079-2). Live tracks: Small Things / Girls Talk / Don’t Call Me Tonight / Slippin’ Away / Information / Crawling From The Wreckage / C’mon Everybody / I Knew The Bride When She Used To Rock And Roll / Falling / Feels So Right / Closer To The Flame / Never Take. Live album released on CD on March 23, 1999 in the US (King Biscuit, 88048). Live tracks: King of Love / Standing At The Crossroads / Ju-Ju Man / Stop Messin’ Around / Queen of Hearts / I Hear You Knocking / I Knew The Bride (When She Used To Rock ‘n’ Roll) / Lady Madonna / The Wanderer / Here Comes The Weekend / Sabre Dance / I’m Ready / Crawling From The Wreckage / Sweet Little Rock ‘n’ Roller / Let It Rock. Live album recorded in 1997 and released on CD in 2000. I Knew The Bride / I Hear You Knocking / Born To Be With You / Let It Be Me / Crawling From The Wreckage / Almost Saturday Night / Warmed Over Kisses (Leftover Love) / From Small Things (Big Things One Day Come) / Girls Talk (live) / Information / Slipping Away / Something About You / Stay With Me Tonight / Juju Man (live) / Do You Wanna Dance / Run Rudolph Run. Compilation released on CD on April 27, 2004 in the US (Legacy, 90278). Live tracks: Intro – Blue Moon of Kentucky –The Claw / Girls Talk / Lady Madonna / Warmed Over Kisses / Blue Smoke / Swinging ’69 / Mystery Train / Love Letters In The Sand / Crawling From The Wreckage – Queen of Hearts / Sweet Georgia Brown / I Knew The Bride / Sukiyaki / Smile / Let It Rock / Sheik of Araby / Mess of Blues – I Hear You Knocking / Welsh Medley / Classical Gas / Allegro / Sabre Dance. Released on CD in February 2005 in Canada (mail order only). From Small Things (Big Things One Day Come) / Me And The Boys / Slipping Away / Louisiana Man / Warmed Over Kisses (Leftover Love) / I Want You Bad / Rules of The Game / I Hear You Knocking (live) / Queen of Hearts (live) / Here Comes The Weekend (live). Released on CD on May 24, 2005 in the US (Sony Music Special Products, 94328). I Hear You Knocking / You Can’t Catch Me / The Stumble / Sabre Dance / In The Land of The Few / Blues Helping / On The Road Again / Summertime / Wang Dang Doodle / (I Am) A Lover Not A Fighter / Egg Or The Hen / 3 O’Clock Blues / So Unkind / The Promised Land / Dance Dance Dance / Outlaw Blues / Sweet Little Rock And Roller / Don’t Answer The Door / Stay With Me Tonight / King of Love. Compilation released on CD on July 4, 2005 in the UK (EMI Gold). Girls Talk / I Knew The Bride (alternate take) / Queen of Hearts / Every Time I See Her / I Hear You Knocking / Crawling From The Wreckage / Born To Be With You / Baby I Love You / Singin’ The Blues / Almost Saturday Night / Slipping Away / Falling Through A Hole / I Got The Will / King of Love / The Race Is On / Baby Ride Easy / Warmed Over Kisses (Left Over Love) / Here Comes The Weekend / It Doesn’t Really Matter At All / The Sabre Dance (alternate take). Compilation released on CD on September 30, 2008 in the UK (Universal). SUBTLE AS A FLYING MALLET / D.E. 7TH / I HEAR YOU ROCKIN’ LIVE / INFORMATION / RIFF RAFF. Compilation released on 5CD in 2013 in the UK (Arista).